We're on our own again, feeling like little kids alone in the big city. But we're not little kids anymore. We did pretty well all by ourselves in Aswan, give or take a couple hundred euros, and we'll be fine in Cairo. Last night we ate dinner in one of the hotel restaurants. Our waiter was a nice, rather shy young man. Each time he came to our table, I was struck by a mark on his right hand. It reminded me of a disco stamp, but smaller. Emboldened by my personal questions earlier in the day, which were rewarded by honest answers, I decided to ask him about his stamp. "What is that on your hand?" I asked him as we were preparing to pay for the meal. "Is that a tattoo?" "Yes. I am a Copt. I love Jesus, and this is the sign." He lifted his hand for me to look more closely. Now I could see. It was the shape of a Coptic cross, tattooed onto his hand. I swallowed and let it out. "We love Jesus too," I said, hoping that I was being truthful, at least for myself. I have suffered so much because of the church! But not because of Jesus. Yes, I do love Jesus, and I will not be ashamed to admit this any more. "I have three tattoos. Would you like to see?" He lifted his shirt sleeve, pointing to two other crosses. This was the first time I had heard of this custom. It seemed barbarian to me, but it also showed amazing identification with Jesus. What impressed me most was his simple statement, "I love Jesus." It's morning, I'm still in bed, and I'm thinking about those conversations with Mohammed and his friend. I'm perplexed, even shocked about myself. How could I ever find any sympathy for the idea of those two marrying? Have I planted an idea in their heads? I certainly hope not. Have I lost my mind? Or my morals? What has gotten into me? Sometimes in this country, I feel like I'm on another planet, but I must admit, life on this planet has its own sort of logic. I'm a firm believer in monogamy and would never want to share my husband with anyone, and I can't imagine anyone wanting to share Mohammed. And yet, the idea of polygamy doesn't seem so shocking, now that I'm here. It's at least conceivable. Would I feel the same way if I were parachuted into a fundamentalist Mormon sister-wife family? None of what happened yesterday would have happened if we'd all have been in Germany. No one would have asked me such a bold question as his friend, and I would have been far too tactful to ask questions about attraction and marriage. Has something taken me over? I've been reading a book I bought in Aswan - Khul-Khaal, by Nayra Atiya. In this nonfiction book, five Egyptian women tell their stories. In almost every story, there is a man with at least two wives. Reading their accounts, I see these women as victims of this system. No one seems to really like it this way. No one wants to be the one to have to share her husband. Sometimes the consequences of living in a plural marriage are even tragic. In one story, the first wife almost succeeded in killing the second wife's son. This seems to be a very unhealthy institution. I believe in people working to make their monogamous marriages successful, and if they're single, to find happiness in that state. I suppose the same kind of work, the same kind of mutual commitment could make a polygamous marriage work, but it seems to me that the entire motivation for such a marriage stems from either amorous feelings of a man, or a desire for children that the first wife can't fulfill. I believe that we are given divine help when we commit ourselves to the well-being of our partners. When I got married, I vowed "For better, for worse", and I still believe in this, twenty-seven years later. I enjoy my married life in the better times, and I grow in character as I accept and learn from the difficult times. This has been my experience, one that I would recommend to anyone. I do hope that Mohammed and his wife can continue to succeed in their marriage. Today we're going to check out bookstores with books in English. After that, we'll go to the Egyptian Museum and look more closely at the ancient treasures we saw in November, when Mohammed inspired us so much we wanted to come back. Peter and I head into the center of the biggest city we've ever spent any time in. The day is pleasant, if a little chilly. But Peter isn't feeling well. The cold, windy air of Alexandria was too much. I hope he's not catching a cold. Walking with Peter, I think about the man I married. I have Peter's undivided love, all these years later. I like - no, more - I love being the only love of Peter's life. There is peace in that knowledge, and at this moment, I feel blessed. We find the bookstores we were looking for, both near Tahrir Square, and buy some books to add even more weight to our suitcases. We have to buy them - they're books you probably can't get through Amazon. Then we visit the Egyptian Museum once again. This time Peter is my guide. We revisit some of our favorite things from the last visit - generally married couples. We look at a sculpture of the dwarf Seneb, his wife and children. How nice to see that a woman of normal size would marry a dwarf and bear his children. The entire family is honored here in this sculpture that was found in his tomb. 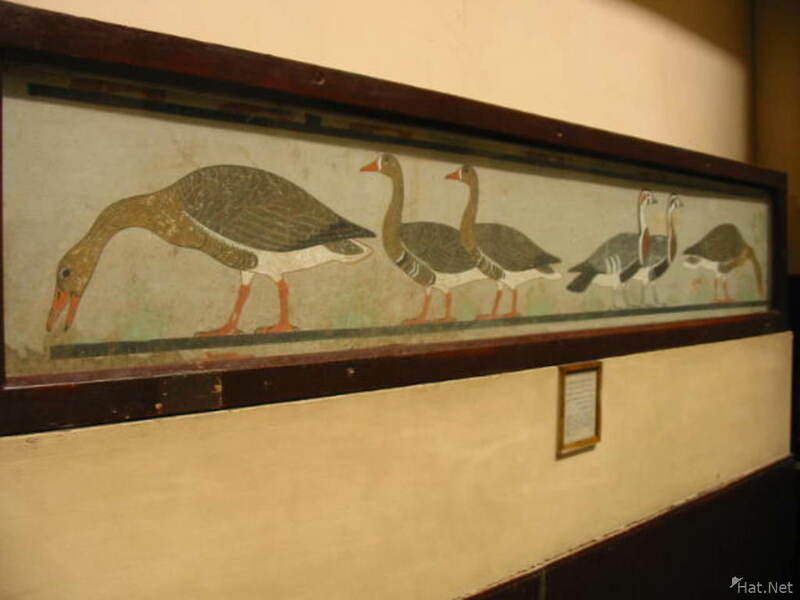 I find the painting of the Egyptian Meidum geese, just like the ones we saw in Aswan, except these are over 3,000 years old. We spend a long time in the Amarna room. There is a fresco there that was found in Amarna, where the Pharaoh Akhenatun and his beautiful queen Nefertiti lived. On the fresco, in lovely pastel greens and browns, are water scenes with lotus plants and reeds, with geese flying overhead. I love its naturalness. We look at the frieze of the Pharaoh Akhenatun and his family. Nefertiti is his equal. 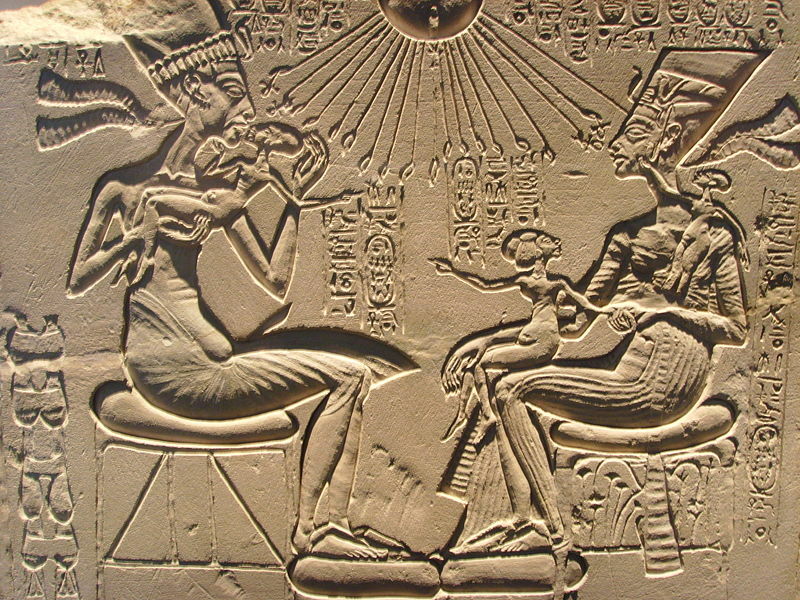 He's kissing his daughter, while the rays of Atun, the one God, shine over this family in the midst of domesticity. Peter's cold is weakening him, and he's about ready to leave me in the museum, when I discover some small engraved clay tablets just outside the Amarna room. These are the Amarna letters. One of these letters indicates a possible connection with the Hebrews, which could explain Akhenatun's unbreakable loyalty to the one God he called "Atun". We are surprised at how small the tablets are, only about three inches (five centimers) square. The cuneiform inscriptions are many and tiny. I continue on my own, this time to see the famous mummies. Here, the most remarkable thing is the fact that I'm standing so close to real, ancient human bodies. Some of them have hair! One of the mummies is Queen Hatchepsut, the famous female Pharaoh who engaged in trade instead of war. Her mummy is 3500 years old. Her identity was verified by a mere tooth, but experts are sure they have their lady. The sign says she was obese and had diabetes. Too much rich food. Her mummy was found only a few years ago in the Valley of the Kings. I revisit the King Tutankhamun exhibit, gazing once more at the glorious throne showing his wife caressing her beloved husband, while the sun shines brilliantly over them, blessing them. I feel blessed, too, as I leave the museum. Now I am completely alone in Tahrir Square. Not even Peter is there to protect me, but he trusts in my ability to take care of myself. I want to go to a church service at the church we attended on Sunday, Kasr Doubara, but the service doesn't begin until 7 pm, and now it's only about 4:30. I decide to look for somewhere to eat Egyptian pastry and drink tea. The only scary thing is crossing the thoroughfare at Tahrir Square, now croweded with rush hour traffic. I stand there, hesitating, fearful of crossing all this traffic. A young man walks up to me. "Do you want me to walk with you?" Yes, I say. "Then you must hold my hand." No, thank you. I will risk this on my own. I dash across the road as soon as there is a slight gap. The cars slow down for me - I'm not going to get killed here, in this spot where so many protestors have been killed or injured by the police who are supposed to protect them. I feel a wave of relief when I reach the other side. There is a pastry restaurant I want to visit, but the challenge is much too great. There are no street signs, no way for me to know where I'm going. If I were with Peter, my map expert, I could get there. But I'm not taking any chances here in this city. I look up and see the Semiramis Hotel, just a few feet away. They should have a tea room - and probably a good one. This may be Cairo's best hotel. I find a lovely tea room overlooking the Nile. I sit down, drink tea and eat delicious Egyptian pastries as the sun sets over the Nile. Our trip is nearly over, and I feel a glow of peace. I am thankful for the rich experiences we have had, for the protection we have enjoyed. The church is packed with young Egyptians, and the only language around me is Arabic. I listen to a worship band lead the congregation in praise songs. I recognize one of them, an old favorite of mine taken from the Psalms, "As the deer pants for the water." I sing along in English. The church sings one beautiful song after another, all in Arabic. A young man volunteers to translate for me into English, so I am able to understand the sermon, taken from Psalm 89. It is about having hearts that thirst after God. He says we need to have a desire like a romantic love for God. Those are the hearts that are like David's, the ones that can receive God's blessing. I am surprised to hear desire for God being compared to romantic love. But then, what kind of feeling could be more intense, more lavish? How Egyptian, how full of passion. We sing a song the man translates for me: "I love you, I love you, I love you. You are my master. You are the rock of my salvation. Your streams of living water flow endlessly." After the service I meet the Korean woman I talked with after the Sunday service. I learn that she is working with missionaries in Egypt. She used to work with disabled children who live in the garbage pits. Now she is working with prisoners. It's wonderful work, she says. She loves her work, she loves Egypt, and would like to stay here forever. I tell her I would love to come back and see her work. "You will be back," she says. "You know the saying - 'If you have drunk from the water of the Nile, you'll be back.' We'll see each other again here." I arrive "home" safely, back with Peter at the hotel. I find picture postcards for me on the bed - one of King Tut and his wife, and the other of the dwarf Seneb, his wife and children. Peter has written me love letters. God is blessing us in our everyday lives, shining rays of love and blessing on us, even at this moment. Although it is night, I fall asleep soaking in bright rays of love and peace.